Can you imagine a country where its Central Government approves a 0% tax (that's right, a zero % tax) for banks so no "autonomous" region can tax banks in the future? This is what happened in the Banana Kingdom of Spain. Three autonomus regions (Canary Islands, Extremadura and Andalusia) were taxing bank deposits. Catalonia intended to do the same. Then Madrid wrote a new law enforcing a "0% tax" that eliminates the possibility for regions to tax banks (according to the bizarre Spanish legislation, no one can pay taxes to two different administrations for the same revenue). Furthermore, the new law planned to compensate regions already having those revenues. 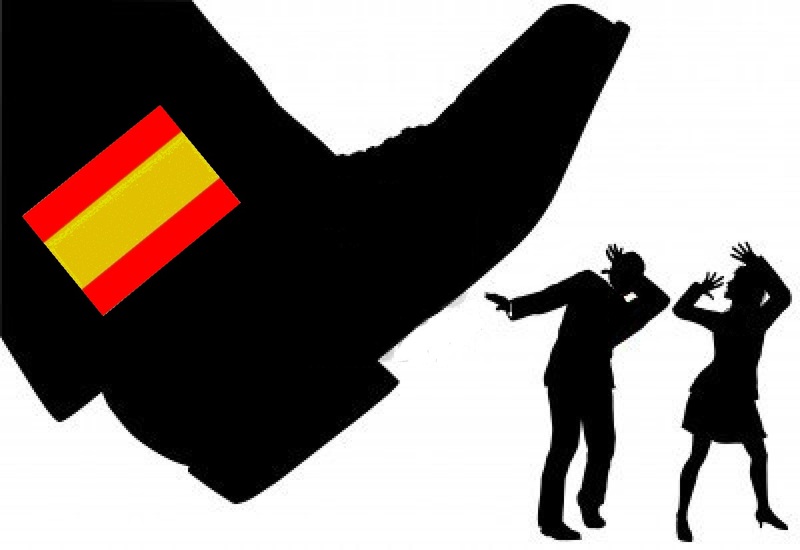 Before that law is approved -in December 2012- Catalonia approves its own law to tax banks. Then Madrid's government appeals to the TC ("Tribunal Constitutional") and just by this the new Catalan law is automatically ruled out (by another bizarre Spanish law the central government can decimate autonomous government laws just by appealing to the TC and not the other way around). Then the Central Spanish Government finally approves its new law taxing banks at 0%. At the same time a minister of this government says that "of course" Catalonia will not be compensated as the other three regions will. Revenues of €500 million is what the "autonomous" Catalan government will not collect this year due to this new Spanish Government law and appeal to the TC. This is more the twice of cuts in education anticipated for this year in Catalonia and about the same amount that has been reduced in the last year in Catalan public health care. At the very same time, another Madrid's appeal to the TC eliminated a one euro tax per prescription that used to save €400 million/year to Catalan tax payers (20 millions collected and 400 million savings in subsidized drugs). Recently the Spanish government spent €5 millions just to renew the Spanish embassy in Rabat while the whole cost of ALL Catalan delegations overseas (the ones you mentioned) is €2.5 million. 43 cents out of each euro we pay in taxes is not invested in Catalonia . 15 days without fiscal pillage would pay all cuts in Catalan health care for a whole year. In two years without fiscal pillage Catalonia wouldn't have any debt. The Spanish state finances between 80 and 90% of the cost of a a senior in a public residence in sevral regions of Spain while it only finances 50% in Catalonia. In Madrid public health care has been reduced €4 for each insured person. In Andalusia €6 and in Catalonia €170. In Catalonia 67% of highways are toll roads while in Madrid only 4%. We Catalans pay a total in toll roads as... France while in Madrid you can use free highways to go anywhere in the peninsula. In Barcelona there are 7400 openings in public kindergarten, while in Seville there are 22000.. In Catalonia there is a computer for every 5 students. In Extremadura one for every two students. A course in a nursery college in Barcelona costs a minimum of 1423 EUROS. In Madrid €1088. Catalonia has the highest taxes in Spain. Public Catalan workers wages have been decreases 5% more than those of the rest of the Spanish state. In Madrid teachers get paid for two extra hours thos course. Not in Catalonia. Public investment in infrastructures has been reduced 8% in Madrid, 7% in Castilla La Mancha, 45% in Catalonia. It has been increased 9% in Galicia, 17% in the Basque country. I disagree on the idea of the euro being not so bad "if countries followed the rules". The matter is not about following rules - as, incidentally, most economic press says - but on the whole idea of some countries (mainly Germany) selling high added-value products to other countries for over two decades and financing part of these sales with tax payers funds from all countries. So there is no "support" of wealthier countries to poorer countries but support to industrial corporations from public funds, while other industry in Catalonia -for example- was sold or shut down. This is what the European Union and the idea of free trade was about. What the poorer countries had to do is to increase their productivity and all these policies have been aimed in the opposite direction so some corporations could increase their gains. People say Greece borrowed money but think about how many Audis and BMWs have been sold to Greece, just to mention a couple of examples. Butr how can Spain, Greece, Ireland and Portugal be left out of the Euro in a politically correct way? There is a solution that could be already in the minds of some technocrats in Berlin and Paris. A new currency- that could may be well called the New Euro- will be accessible for selected countries, those of the the higher speed. This would allow the PIGS -and maybe some other country like Italy and Belgium- to reach by devaluation of the regular euro the growth required to create jobs and pay back the debt that internal devaluation alone will only make bigger. So much for the "facebook revolutions"
Now the World Bank and the European Development Bank are willing to help- guess who - some North African countries , beginning with Egypt, Morocco, and Tunisia. I always suspected that those "Facebook revolutions" were not as spontaneous as they were presented by the media. Why the development banks are all of a sudden ready to 'help' these commodities rich new democracies? Because they have revenues to pay back loans. Who wants to help the PIGS who have been economic basket cases for decades ? Who cares on what kind of democracy they got or they already had. The case of Morocco is ludicrous since it is a very old dictatorship but with strong ties with big western corporations. So these countries will be perfect substitutes for the PIGS until they are dried up and thrown down the toilet as used kleenex. But before that they will buy lots of Mercedes and Siemens. And they have either a more expensive oil (than olive one) or other interesting commodities. Only a little of "liberalization" was needed for some of these authocratic countries. So much then for the Facebook revolutions. Germany has a bigger debt as a percent of GDP than Ireland, Portugal or Spain. Meaning they have spent more than they collected in taxes, so they did a worse job than those countries. If German productivity was as high as they believe, why their debt was higher? Something doesn't not make much sense. And still rating agencies like German bonds but the answer is not obvious as some people think. Selling goods involves producers but also buyers. This was very well known by Americans after the end of WWII when they created the Marshall plan to rebuild Europe. the difference is that most Western Europe used the money not only to buy american goods but to rebuild their own industries. Something that policy makers in the EU never approved. The resulot is that in the end German (and other) banks lended billions to Greek companies (public and private) and this money was used to buy German exports. And German (and Greek, and Spanish) tax payers are supposed not only to bail Greece out but to bail German banks out. This might not make sense for you and me but it makes all the sense for the so-called bond vigilantes. As for Japan, it is not the same as with Germany. Despite its high productivity it has been for many years a victim of the same birds of prey. Very recenly Japan has been under the menace of Moody's and S&P. Somebody recently told me that he read that "wealthy Greeks are sending their money to places like Cypress and that they are deceitful ,self interested buggers - ready to rob their own country and then flee". Come on, you can change "Greek" by "German" and the same is still very true. What bond predators want is that tax payers pay to bail out banks and that wealthy people benefit from lower taxes, regardless of living conditions of the majority of the people,just as in the Third World. Very soon we all we have to carry a gun with a holster to walk down the streets. Then rich men will ask for more police (apparently the only social spenditure they approve) but who is going to pay for it? Some government minister of culture of Brazil called crime 'the tax of the unequality' (i.e. the price rich people have to pay for living in an unjust society). People of the elites use rating agencies, the Council of the European Union, the IMF and other institutions to rule the world. Their current aim is to finish social policies in the European Union. They praise the US model of society and they have everything they need to bypass democracy. These people created a huge mess when they designed a monetary union among countries of different productivities having in mind only short to medium term profits of big corporations and banks. And now they of course still have the same in mind. All governments borrow money regardless of their productivity. Today Germany has higher debt as a percent of GDP than Spain, Portugal or Ireland. And only since recent times it has a lower debt than Greece. But when governments have to borrow money from the open market its bond auctions are strongly influenced by ratings of agencies that have a very biased view on how economies should be ruled. So let's first discuss the role od ratings agencies. I believe these agencies are creating a tremendous harm to people across the world and therefore should be punished by law. Although they are just small private and very biased instituitons they dictate government policies that destroy social security networks and hence create unemployment. Of course this does not help to pay back government -nor private- loans but the élite of vigilantes, apparenly blind to the obvious, do not seem to acknowledge it. Moody's, Fitch and Standard & Poor are directed by people who believe that workers should -just like in the U.S. - not have public pensions nor public health care. Yet rating agencies showed little or no knowledge of economy when they gave AAA ratings to Lehman Brothers or Madoff. In few words: their ratings are proven to be either very wrong or plainly fabricated. But still these ratings can sink the economies of whole countries. One of the most unfortunate cases has been the one of Portugal, a country that was growing consistently and had low unemployment rates until the "vigilantes" decided to torpedo it just because they did not like its social policies. It could be true that Greece spended too much. But this is an oversimplistic vision of a problem that affects other countries - as Spain- that also taxed too little big fortunes and have a huge underground economy. How could Germans have the guts to rein Greek spending when this spending involved the purchase of German goods? in the first place, unless the élites had only in mind the short to medium-term profit of big German and French corporations. And these elites probably suspected that all would end badly. It is not a coincidence that Germany and France were in a hurry to approve the Lisbon Treaty (formerly presented as "the European Constitution") that states new rules to create a blocking minority in the decisions of the Council of the European Union. Former and current Francoists often picture dams as a success of the former regime. Most dams were built in upstream portions of upper Catalonia rivers and had the main purpose of power generation (at the time hydroelectric power generation in Spain used to amount to over 50% of the total electrical consumption.) But this system planned by dictatorship technocrats has been proved to be highly ineffective regarding flooding of coastal areas and usage of seasonal floodwaters . However, since the end of the Franquism, no major project has been endeavored to improve the management of these problems in southern Catalonia. Presently twelve water systems in southern Catalonia run with no flow regulation. Among these are the Besòs and Fluvià rivers and its tributaries. Smaller watercourses as the creeks in the Maresme region have no flow control either and its seasonal floodwaters are also wasted to the sea. Among the reasons to avoid undertaking any project to avoid water flooding and to collect rain water in coastal areas is the fact that these watercourses have a very low average flow and run along highly populated areas. These are, nonetheless chief reasons to think about new water management solutions. Flooding of coastal areas occur almost every second year along the courses of unregulated rivers like Besòs and Fluvià. On the other hand, droughts are becoming a serious problem in the Barcelona area. For instance, Besòs river – a system that takes two thirds of its water from the Ter and Llobregat systems- has a typical average Mediterranean flow of only 2 cubic meters per second . But this value is actually ten times higher than the median daily flow of Santa Ynez river in California prior to the construction of Cachuma reservoir in 1952. Santa Ynez river flows used to be highly variable before its regulation and could multiply by 2000 during seasonal storms (twice as the Besòs river). Considering an area of 400 square kilometers along the Besòs river and its tributaries where the annual precipitation is around 900 mm, a water collecting system could collect up to 360 milion cubic meters (Sau-Susqueda-Camarasa system has a capacity of 459 milion cubic meters.) Even collecting a fraction of this amount would be highly beneficial. California seacoast projects like Cachuma, Santa Maria and Ventura are highly explanatory on what should be a properly planned water management project in a Mediterranean climate. Instead of poorly planned canals or inflatable dikes along the course of the river (as those made recently in the Besòs river) management of the level of the aquifers and capturing seasonal floodwaters are key in avoiding floods and fighting drought. A project of this magnitude should include several regulating reservoirs and multiple conduits and water tunnels in both sides of the litoral mountains. Properly designed flow regulation must ensure environmentally healthier water systems. It must be noticed that by no means I am proposing to re-create the Pharaonic Francoist dams neither some of the errors of the Southern California water management. Coastal water collecting in plausive conditions for the natural environment and for its proper attainment imply that the banks of the feeding streams must be wooded to avoid silting of the reservoirs. Deforestation is therefore totally adverse to a project of these features.